Confession: I had an off week last week. Between all of the Halloween festivities, we were either eating at a party, eating grilled cheese, grabbing food at grandma's before another party or I just flat-out forgot to take pictures of Ethan's meals. I blame the Halloween chaos but my husband ensures me it's just me being human, so we'll go with that. I was browsing the internet for some fun, unique cauliflower recipes. Ethan loves cauliflower, I had picked up a head of organic cauliflower at the health food store, and I just needed something fun to do it with it. I saw this recipe for Popcorn Cauliflower on InspiredRD and it seemed like a great idea. I did make some changes to their recipe, but it was the same general premise and the outcome was the same: kids love it! I loved that this was versatile as both a meal and a snack. It packed up well in little containers to stick in our lunchbag when we were leaving a Halloween party and Ethan's little tummy was rumbling. 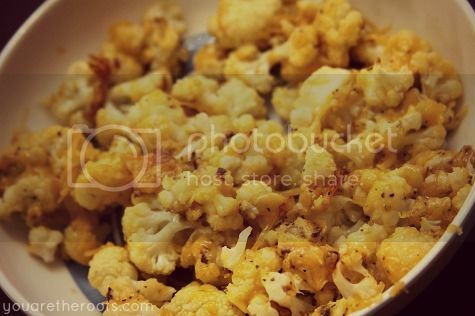 To make this, I chopped up some cauliflower florets until they were small like popcorn. I preheated the oven to 425 degrees and laid out the florets on a cookie sheet topped with parchment paper. I spritzed them lightly with some organic olive oil, sprinkled them with some black pepper and tossed them with some minced garlic. I baked the florets for 25 minutes. Once they were finished, I put the hot florets into a mixing bowl and tossed them with a handful of shredded organic cheese. I sprinkled them with some Parmesan cheese and then they were ready to be inhaled by a hungry little toddler! That sounds delicious! I'll have to try that! Wow I can't wait to try this! Would make a good party food too, easy to make and kids will love. Cauliflower was one of my 'new foods in 2011'. It's definitely one of my favorites now [though I only eat it roasted, there are 80 million variations for flavor! ].